Updated on 3/12/2011 to include the link to the source of the quote. Tuesday's Wall Street Journal Urban Gardner column carried a bit of news for tea lovers. In 1917, as told to Ralph Gardner Jr. by John Krawchuk, the New York City Parks Department's director of historic preservation, John Sloan, Marcel Duchamp, Gertrude Drick and other "Bohemians" stole into the Washington Arch and "drank tea late into the night" on the roof! Read more the Arch's roof here. It was on the cold, snowy evening of January 23, 1917 that painters John Sloan and Marcel Duchamp, poet Gertrude Drick, and Provincetown Playhouse actors Alan Russell Mann, Betty Turner, and Charles Ellis slipped through an unlocked door and climbed up the spiral staircase to the roof of the Washington Arch. These six so-called "Arch Conspirators" then spread out blankets, hung Chinese lanterns, tied red balloons to the arch’s parapet, sipped tea, shot off cap pistols, and conversed until dawn. At some point during the night, the ringleader, Gertrude Drick, read a proclamation by candlelight into the windy night -- a declaration of independence for what the Arch Conspirators, somewhat ironically, called the "Free and Independent Republic of Washington Square." 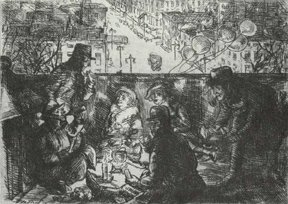 That cold January night on the top of the Washington Arch was immortalized graphically by John Sloan’s 1917 print entitled "Arch Conspirators," depicting the artists and bohemians chatting by candlelight high above Fifth Avenue, balloons buffeted by the wind. Social commentator Luc Sante astutely noted that the slightly comical declaration of January 23, 1917 "actually named the thing that all the inhabitants of the Greenwich Village bohemia of that time were aiming for, a revolution in more than just a legislative sense, a free territory untrammeled by convention."